Show of hands...how many of you sit on Pinterest for an unreasonable spanse of time pinning little projects and say "oh I'm totally going to do that!"? Ok...now how many of those have you done? No worries...I'm the same exact way. So let's put some of that inspiration to good use! 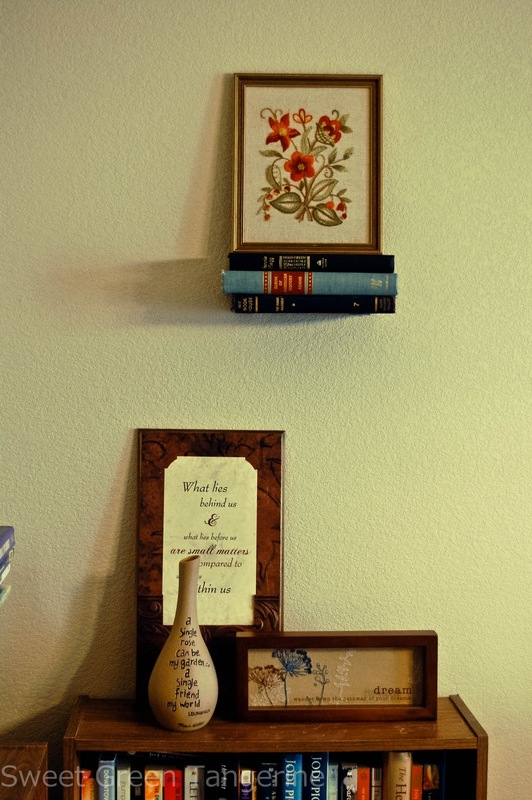 My first pinterest project up to bat is this darling floating bookshelf. I immediately thought of how precious it would be in my craft room above the bookshelves. I went to a local thrift store (big surprise there) and found a classic looking hard back book for $.50. Pick a book with a spine that appeals to you but one you don't plan on reading. Keep in mind that you will be ruining the book and it will no longer be readable. Note to bibliophiles: take a deep breath. If I can do it, you can too. L-brackets. Found at your local hardware store. I just asked an employee. Practically had to play charades to explain what I wanted, but he finally found it for me. 8 screws. 4 should be short enough that they will not go all the way through the book. Anchors may also be necessary depending on what you're drilling into & whether or not you would like it to be sturdy. May I suggest that you get a clamp from the hardware store & clamp the book shut real tight before screwing. My book got a little warped because things moved around a bit too much. Level it up there on the wall. Again. Screw those puppies in. If you need to use anchors to make it sturdy, trust me when I say you don't want me telling you how to do that. Find a handier person to show you the CORRECT way to do that. My way involves mistake holes and/or pure luck. Put some books on there or some artwork to hide the brackets. Alright...now step away from the computer & go tackle a project! Don't forget to come back & share! That's amazing! You are so crafty. Can I hire you to decorate my house? Looks fantastic! btw, I'm a doer! I try what I find :) but this can thing isn't working out so well for me. Ha this post came at the perfect time. I just recently got into Pinterest and now I'm obsessed, like everyone else! Those floating bookshelves are adorable. it's really quite simple. came out great.